An array of gargantuan gourds were presented at a pumpkin weigh-off in northern California on Monday, but only one proved massive enough to take home the top prize. Joel Holland, a retired firefighter from Sumner, Washington, was crowned the pumpkin king at the Safeway World Championship Pumpkin Weigh-Off with his 2,363-pound mega-gourd, organizers announced. The award-winning pumpkin farmer set a new American record with his prized pumpkin, which is also the second heaviest gourd ever grown in the world. 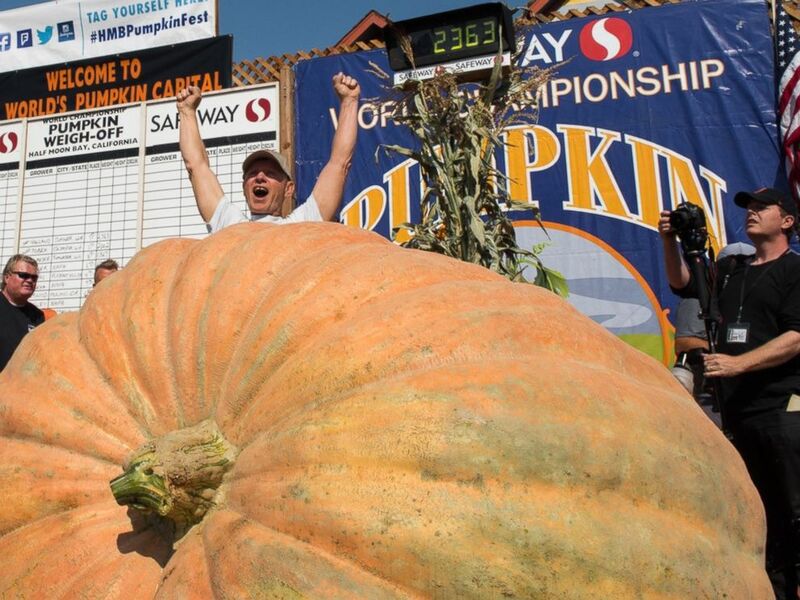 Joel Holland won the Safeway World Championship Pumpkin Weigh-off in Half Moon Bay, Calif. with a 2,363-pound pumpkin. It was Holland's seventh win at the annual competition. He took home $7 per pound, earning him a grand total of $16,541.